Music in "The Immortals" Theatrical Trailer. Boom. & The gods go boom. My Music cue, “The Undertaker” was used in the “The Immortals” trailer starring Mickey Rourke. You can hear it’s hotness at :30-1:02. and again at the very end. Special thanks to my friends at XRD. The trailer for Relativity Media’s The Immortals has come online. Opening in 3D and 2D theaters on November 11, the Tarsem Singh-directed film stars Henry Cavill, Stephen Dorff, Isabel Lucas, Freida Pinto, Luke Evans, Kellan Lutz, John Hurt and Mickey Rourke. 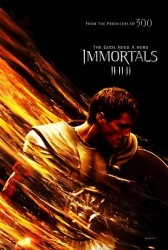 In The Immortals, a power-mad king razes ancient Greece in search of a legendary weapon and a heroic young villager rises up against him.